The memories of the many celebrations held in the ballroom at Todmorden Town Hall are the focus of the next tour of the building on Sunday 7 October at 2pm. 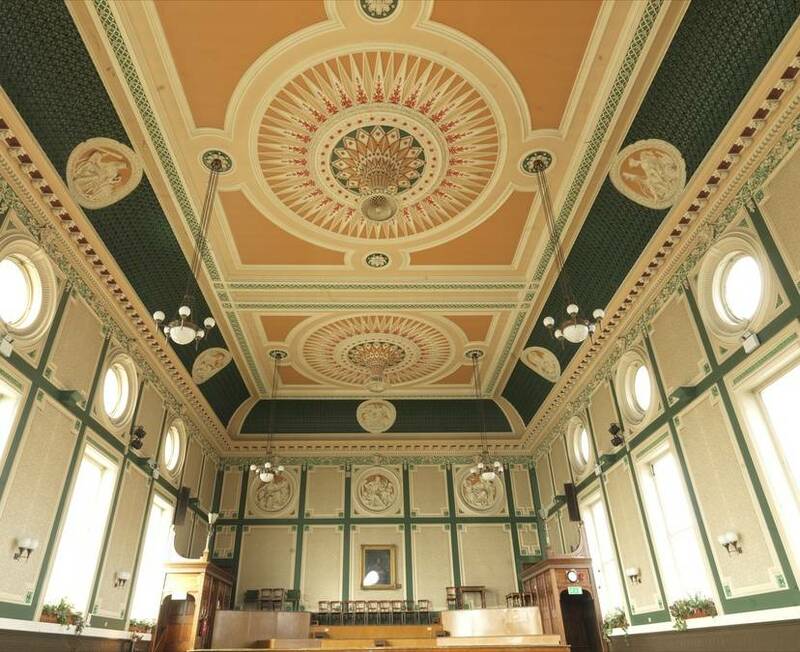 The ballroom is one of the focal points of Todmorden Town Hall, with its richly ornamented ceiling and plasterwork. The room has held a variety of events over the years, including Todmorden Mayor Making ceremonies and many weddings. It hosted the BBC Children’s Hour in 1944, BBC Clothes Show in 1988 and more recently the illusionist Derren Brown’s programme The Secret of Luck in 2011. It has also been the location for many famous speakers, including Victorian politician, Lord Frederick Cavendish and founder of the Salvation Army, General William Booth. The guided tour, led by Town Hall volunteers, will tell the stories behind the ballroom as well as providing details about the Friends of Todmorden Town Hall group, which aims to bring people together to strengthen the community voice to raise the profile of Todmorden Town Hall. “Many people in Todmorden will have been to an event in the ballroom over the years. The next free tour of the Town Hall will look back at some of the momentous occasions that have taken place, as well as offering a chance to look around at this impressive building. To find out more about hiring the venue, visit www.calderdale.gov.uk and search for ‘Todmorden Town Hall’. You can also contact halls@calderdale.gov.uk, for more information or to discuss requirements. This entry was posted in Community, Community volunteers, Heritage. Bookmark the permalink.